In June of 2011, a team of Chinese and Swedish researchers rediscovered the breeding area for the Blackthroat Luscinia obscura, in the Qinling Mountains, Shaanxi province, in north central China. Seven singing males were seen in Foping and seven more in Changqing National Nature Reserves. This is a spectacular find because that nearly equals the total number reported since its discovery in the late 19th century. It suggests that even if they haven’t thrived, their numbers must be about the same. Almost all of the birds were seen on mountain slopes at 2400 meters above sea level in dense expanses of bamboo. In the late 19th and early 20th centuries, about 10 Blackthroats were collected in both the Gansu and Shaanxi provinces during breeding season. But after that, there have only been a handful of unconfirmed sightings from Sichuan and Yunnan provinces. The most recent was of a bird photographed during migration in the campus of the Sichuan University on May 2, 2011. One was also caught in Thailand in winter. 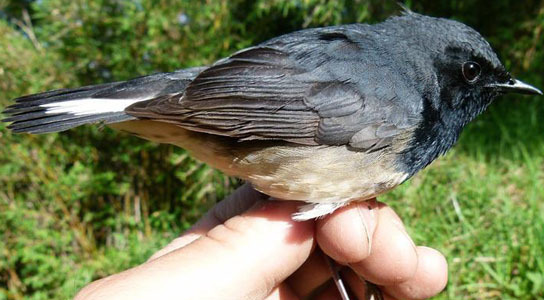 Be the first to comment on "Breeding Area for the Blackthroat Luscinia Obscura Discovered"